朱永华(1986-), 男(汉族), 内蒙古自治区乌兰察布市人, 博士生, 主要从事水环境科学与工程研究。E-mail:Yh_Z@imau.edu.cn. 张生(1960-), 男(汉族), 内蒙古自治区包头市人, 教授, 博士生导师, 主要从事水环境科学与工程研究。E-mail:Shengzhang@imau.edu.cn. 第一作者：朱永华(1986-), 男(汉族), 内蒙古自治区乌兰察布市人, 博士生, 主要从事水环境科学与工程研究。E-mail:Yh_Z@imau.edu.cn. 通讯作者：张生(1960-), 男(汉族), 内蒙古自治区包头市人, 教授, 博士生导师, 主要从事水环境科学与工程研究。E-mail:Shengzhang@imau.edu.cn. Abstract: [Objective] To explore the relationship between groundwater depth and plant community characteristics and soil physicochemical property, in order to provide a basis for the healthy and harmonious development of ecological environment in Tongliao Plain of West Liaohe River basin. [Methods] Based on the methods of space-time substitution and soil single fractal, the vegetation community characteristics and soil physicochemical property were quantitatively analyzed, and their response mechanism to the change of groundwater depth was discussed. [Results] ① The order of the vegetation diversity indexes under different groundwater depth was showed as: 2-3 m > 1-2 m > 4 m > 3-4 m > 0-1 m. ② The topsoil particles were mainly composed of silt with the content between 52.03% and 84.78%. 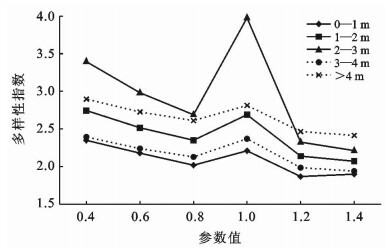 The average size of soil particles was ranked as: 3-4 m, >4 m, 0-1 m, 1-2 m and 2-3 m. ③ The kurtosis were all very narrow. The fractal dimensions were between 2.34 and 2.49. The distributions of soil particle size were all in poor sorting. Correspondingly, the skewness were nearly symmetrical, nearly symmetrical, nearly symmetrical, negative sand negative, respectively. [Conclusion] With the change of groundwater recharge conditions, the succession of vegetation community in the study area is a process from non-zonal meadow vegetation to the zonal typical steppe vegetation. The critical range of vegetation succession is 2-3 m underground water depth. 王娅, 周立华, 魏轩. 基于社会-生态系统的沙漠化逆转过程脆弱性评价指标体系[J]. 生态学报, 2018, 38(3): 829-840. 岳喜元, 左小安, 赵学勇, 等. 科尔沁沙地沙漠化风险评价[J]. 中国沙漠, 2018, 38(1): 8-16. 赵学勇, 张春民, 左小安, 等. 科尔沁沙地沙漠化土地恢复面临的挑战[J]. 应用生态学报, 2009, 20(7): 1559-1564. 马玉蕾, 王德, 刘俊民, 等. 地下水与植被关系的研究进展[J]. 水资源与水工程学报, 2013, 24(5): 36-40. 王旭升, 万力, 齐蕊, 等. 鄂尔多斯高原地下水与植被盖度的相互影响[J]. 第四纪研究, 2014, 34(5): 1013-1022. 满苏尔·沙比提, 胡江玲. 新疆渭干河-库车河三角洲绿洲地下水特征对天然植被的影响分析[J]. 冰川冻土, 2010, 32(2): 422-428. Kennedy M P, Milne J M, Murphy K J. Experimental growth response stoground water level variation and competition in five British wetland plants pecies[J]. Wetlands Ecology & Management, 2003, 11(6): 383-396. 张天曾. 中国干旱区水资源利用和生态环境[J]. 自然资源, 1981(1): 62-67. 孙丽, 刘廷玺, 段利民, 等. 科尔沁沙丘-草甸相间地区表土饱和导水率的土壤传递函数研究[J]. 土壤学报, 2015, 52(1): 68-76. 蒙仲举, 王猛, 高永, 等. 基于土壤粒度参数的荒漠草原地表粗粒化过程[J]. 水土保持研究, 2017, 24(6): 22-28. 张惜伟, 汪季, 高永, 等. 呼伦贝尔沙质草原风蚀坑表层土壤粒度特征[J]. 干旱区研究, 2017, 34(2): 293-299. 王琴, 蒙仲举, 汪季, 等. 希拉穆仁草原近自然恢复状态下植被-土壤响应特征[J]. 生态学报, 2017, 37(4): 1159-1167. 张佳瑞, 王金满, 祝宇成, 等. 分形理论在土壤学应用中的研究进展[J]. 土壤通报, 2017, 48(1): 221-228. 丁延龙, 高永, 蒙仲举, 等. 希拉穆仁荒漠草原风蚀地表颗粒粒度特征[J]. 土壤, 2016, 48(4): 803-812. 朱永华, 张生, 孙标, 等. 科尔沁沙地典型区地下水、降水变化特征分析[J]. 干旱区地理, 2017, 40(4): 718-728. 魏彬, 海米提·依米提, 王庆峰, 等. 克里雅绿洲地下水埋深与土壤含水量的相关性[J]. 中国沙漠, 2013, 33(4): 1110-1116.